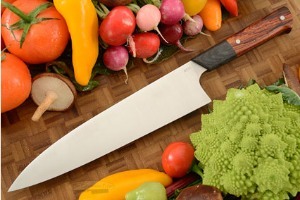 Description: Rose City Knifeworks was founded in Portland, Oregon by Joe Walters and Paul Kolba. Their goal is to create exceptional knives suitable for both the skilled amateur cook and experienced culinary professional. Their knives combine the best parts of tradition, design, and modern production to create high performance cutlery at an affordable cost. 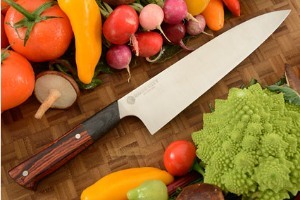 The gyuto is modeled after the French pattern chef's knife. Longer and slimmer than the santoku, it is suited to preparation of meat and may be used as a general purpose chef's knife. The long blade is needed for the sawing motion required to cut meat and the slim profile keeps the weight low and the balance right. 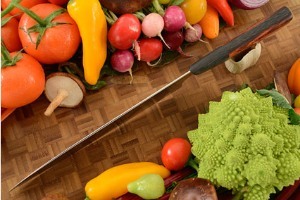 This knife has plenty of finger clearance for the rocking chop needed to chop onions and other vegetables. The blade is formed from AEB-L stainless steel and tempered to Rc 61-62. AEB-L stainless steel is ultra high performance -- combining the convenience of stainless steel with the ability to take an acute edge and hold it (a characteristic usually only found in carbon steels). AEB-L steel was designed for razors, which need corrosion resistance, high hardness, and very acute edges. Once you try a knife that is made with AEB-L, you'll immediately understand why it is coveted by knife enthusiasts, knifemakers, and professional chefs. The resulting blade has an extremely keen, long-lasting edge. The distal tapered blade creates a perfect balance. 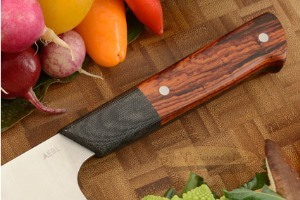 A rounded spine and choil ensures the knife will be comfortable even after hours of use. 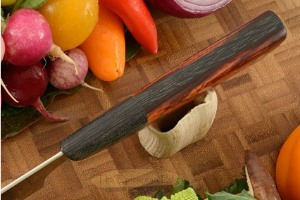 The fusion style handle brings together some of the best aspects of traditional Japanese and Western handles. 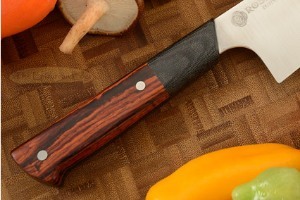 Warm toned cocobolo is combined with a black micarta bolster and frame. For strength and durability, the handles are set with two stainless steel hidden bolt rivets. This ambidextrous handle is easy to grip and lasts a lifetime. Like other kitchen knives, this knife should not be put in a dishwasher. 0.328125 0.0625 328.125 62.5 Trailer Started.